The food is very good!!!! i tell everyone about Roadrunner and how nice the staff is to everyone. Everytime we go home to Winnsboro, we always go there. Great food, reasonably price. A great little burger (and more) joint that someone like Anthony Bordain would appreciate. Nothing fancy by any means. Burgers, chicken, salads, wings, etc. The potatoes...you have options!!! You pick one of three ways: Raw fries, home style fries, or crinkle cut. Then, they give you a choice in how well you would like them cooked, if you would like seasoned salt, and if you would like malt vinegar on the side. How fun. The tea is crazy sweet....so that is either a good or a bad thing (you chose). Call ahead, order and sit on the porch, or bring your meal home. A great restaurant and fun too. 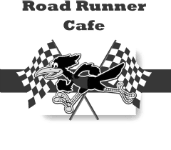 Glad to have Road Runner Cafe in my town.